So I got a call today from my account rep over at PC Connection, so she and I got to talking, and she mentioned a new notebook computer that had gotten demoed in her office. It's called the "Ferrari Notebook", and is built by Acer. So, now this thing cracks me up big time. 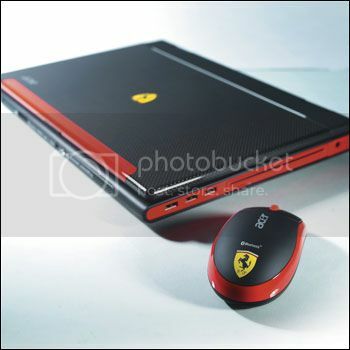 Really, a Ferrari notebook computer, just what ever IT person who is trying to over compensate needs (wink wink). LOL. Or, as my account rep suggested to me, its really good for the President or VP of the company. I laughed really hard when she said that. Cus, our GM / Co-Owner is the only one who might even need such a high performance computer, and even then its over kill for him. Our two VP's would not even know what to do with this thing, beside maybe drop it. LOL. I really don’t need a show computer, as all I really care about is performance, and reliability (which is why I got Dell). Both my home and work laptops are Dell's and are both really damn good computers that almost never fail. When they have failed, Dell has fixed the problem and it was fixed quickly. I have never had a problem with Dell's tech support people, and I can even understand them! But, still when I saw this thing, I laughed hard! According to my rep, its even got a porsche hard drive. LOL Too Funny! Anyway, I thought you all would get a kick out of this thing.